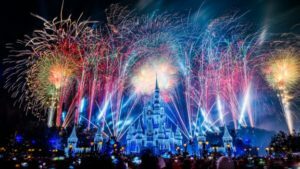 If you’re not going to be in the Magic Kingdom on New Year’s Eve this year you can still be part of the magic and enjoy the fireworks from the comfort of your couch! The Disney Parks Blog will be live-streaming the Magic Kingdom’s December 31 fireworks show starting at 11:45 p.m. The special performance of the Fantasy in the Sky fireworks includes songs from “Peter Pan,” “Pinocchio” and “Aladdin,” plus music from “it’s a small world” and the Haunted Mansion. Just visit the Disney Parks Blog Monday night at 11:45 p.m. and be part of the celebration. You can even use the hashtag #DisneyParksLIVE and you might be included in their live stream.